One of AMD’s main selling points it likes to promote is towards the gamer, especially those on a tighter budget. 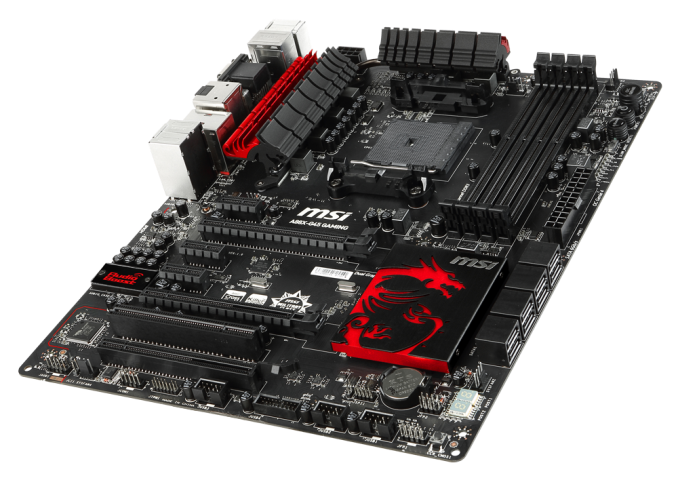 This subsequently suggests to the motherboard manufacturers to build models oriented for gaming. MSI’s Gaming Range has become a solid part of MSI’s plethora of motherboards, and now this extends to the FM2+ platform. 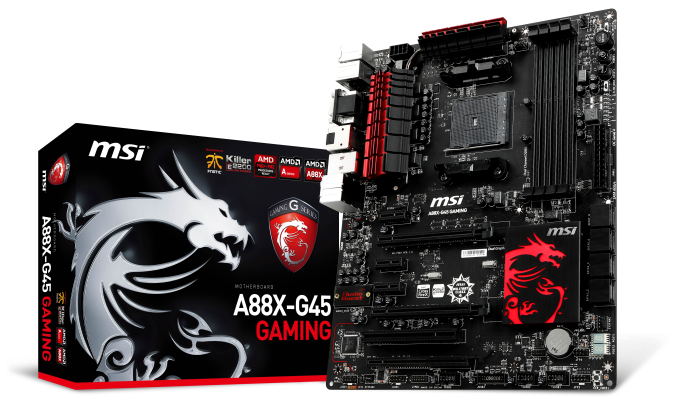 Today we review the MSI A88X-G45 Gaming. One might suspect that the concept of discrete GPU gaming goes against the purpose of the AMD FM2+ platform. Here is a socket and chipset designed for an APU that is optimized for its integrated graphics, so why would a user purchase such an APU and then disable access by adding a discrete GPU? Or use a motherboard with the APU and then use two graphics cards in Crossfire? One could argue that if the motherboard is used in dual graphics mode with another PCIe card (RAID, Sound Card, FPGA) that this is the optimal scenario. So why would such a motherboard be advertised as supporting 2x and 3x Crossfire with discrete graphics cards? The answer is simply ‘because it can’ and ‘performance with a high end APU with discrete graphics is still pretty good’. We could also argue the cost route – investing in a quad thread, overclockable AMD APU is cheaper than the competition. At $119, this is clearly where MSI is aiming with the A88X-G45 Gaming. The low cost, gaming oriented product is promoted as supporting multi-GPU gaming with AMD graphics cards while also sporting several gaming features. MSI loves the Killer networking interface range, and as such the E2200 series NIC is implemented, along with software to manage the priority of any program or game that needs network connectivity. There is also a high-polling USB 2.0 port, enhanced Realtek ALC1150 audio with Sound Blaster licensing and a Gaming Series stick-on badge in the box. Other features on the motherboard include a one-button overclock with two modes, fan profile control via the BIOS or the provided software, and stabilized 5V USB power to minimize power jitter to signal sensitive USB devices. The motherboard has eight USB 3.0 ports in total, two via a header and six on the rear, with some of these on the rear coming from a VIA VL805 controller. There are also eight SATA 6 Gbps ports and a TPM header. Despite the motherboard having five fan headers, the built in software only allowed control of two plus the CPU header. The fan control software for MSI, as mentioned in recent MSI reviews, has improved especially in the BIOS with a more detailed adjustment system. 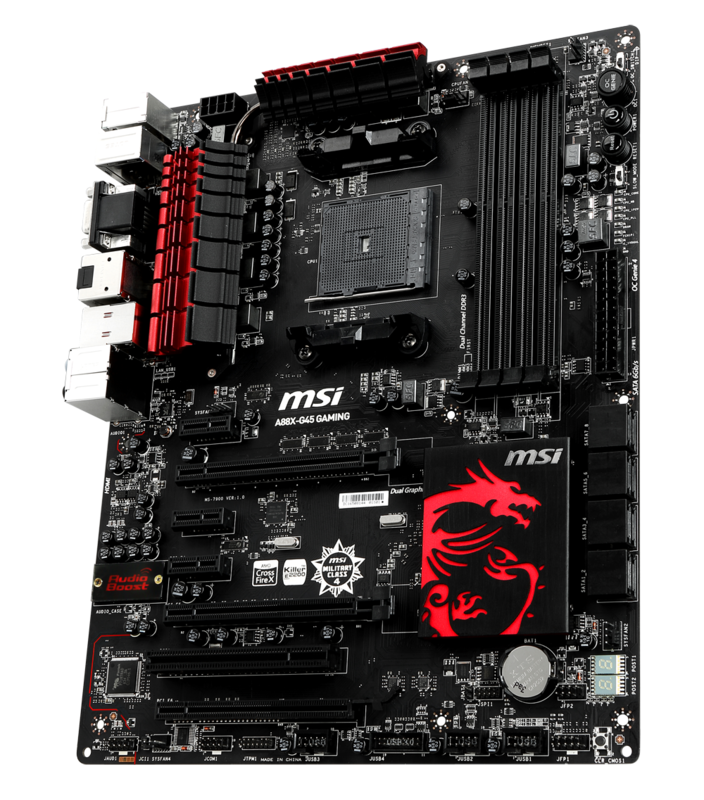 Overclocking on MSI’s FM2+ system is via the BIOS and software, but only allows CPU voltage adjustment in terms of an offset rather than an absolute value. Neither of these issues is critical in terms of operation. Unfortunately the easy XMP enable of MSI’s 9-series is not here. Overclocking performance gave us 4.5 GHz on our A10-7850K, with any more frequency requiring voltage that caused the system to reduce frequencies under load. Compared to some of our previous A88X reviews, this is actually a rather good overclock. Automatic overclocking gave a good leap to 4.25 GHz and a 15% gain in POV-Ray performance. The shining light in the performance of the MSI A88X-G45 Gaming, perhaps ironically enough, is the gaming. Frame rates with a discrete graphics card for all our games were near the top or exceeding some of the previous best using the A10-7850K APU. The CPU performance by comparison was below average when directly comparing to other A88X motherboards; some benchmarks were either first or second, although the majority were in the bottom half. System performance has longer POST times than most at 15+ seconds, and audio performance for the codec used is towards the lower end of our testing. Power consumption is some of the best A88X we have seen, showing under 150W with an OCCT load, compared to the 150W+ of many of the other motherboards. 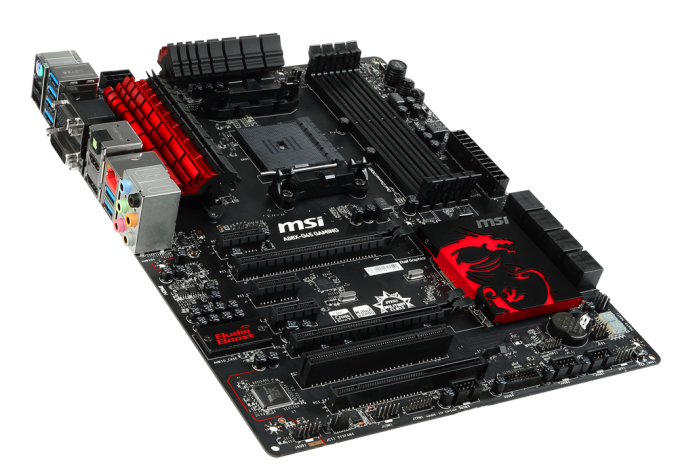 As with most of MSI’s new range of gaming motherboards, the red and black livery is often the first thing noticed and remarked upon. Since introducing their dragon themed gaming series, MSI has indicated that sales are up and its users are pleased. While it might not be to everyone’s taste, and as users have remarked in the past ‘what use is styling when no-one is going to see it’, good aesthetics are always a positive in our reviews. It shows effort on presentation, and indicating that buying such a product is an experience more than a function. On the motherboard, the two power delivery heatsinks around the socket are joined by a heatpipe, with several fins on the heatsinks to help add surface area for cooling. Due to the rectangular nature of the AMD socket, we seem to be up against the AMD specifications at the top of the motherboard, but with more space on the other three sides for coolers. Users with all DRAM will have to orient non-square heatsinks appropriately to avoid conflict. In the socket area there are three fan headers within easy reach – the four pin CPU fan header above the socket, a 3-pin SYS header to the top right beyond the DRAM slots and a 4-pin SYS header just above the first PCIe 2.0 x1 slot. The other two fan headers are located at the bottom of the board. The DRAM sockets are in plain black, and use latches on both sides rather than single sided latches, presumably because the first GPU slot is the second PCIe slot on the motherboard. There is a handy diagram on the motherboard, to the bottom left of the DRAM slots, to show which slots should be populated first. 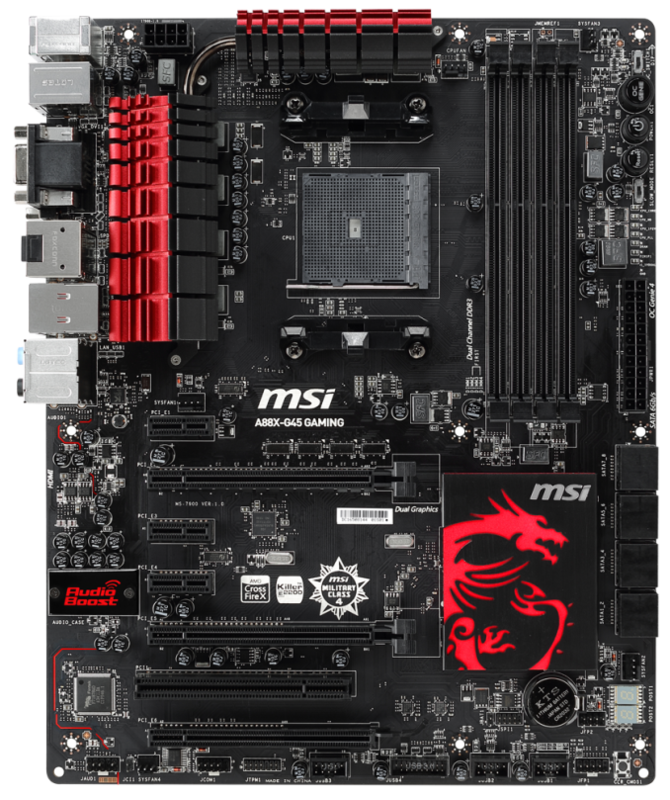 On the top right of the motherboard are a number of MSI’s extra features. First is the OC Genie Switch which adjusts the severity of the OC Genie overclock which is enabled by the OC Genie button underneath the switch. Below the power and reset buttons is a slow mode switch that forces the motherboard into running at idle speeds regardless of the CPU load. This is primarily used by overclockers to get stability after a benchmark run. Underneath this switch is a series of lights indicating what stage of the POST process is being run, and can be useful for diagnosing POST issues. Further down the right hand side is the 24-pin ATX power connector, followed by eight SATA 6 Gbps ports all provided by the A88X chipset. The chipset is underneath the dragon heatsink to the left of the SATA ports. At the bottom right of the motherboard is the two-digit debug display, a 4-pin SYS fan header, the USB 2.0 and USB 3.0 headers, a ClearCMOS button and the front panel headers. One of my recent criticisms of MSI motherboards is that the front panel header is not labelled with what pins are for which connection, regardless of any aids in the box. It should, ideally, be a fundamental part of any motherboard. The bottom of the motherboard also has a TPM header, the COM header, another fan header (3-pin) and the front panel audio header. The audio system is controlled via the Realtek ALC1150 audio codec which MSI has placed under an EMI shield. The motherboard also uses additional filter caps for the rear audio and PCB separation to improve the audio signal by minimizing interference from digital traces. The PCIe slots are designed primarily for one or two large PCIe devices, although three AMD GPUs can be used in an x8/x8 + x4 configuration. Like all FM2+ motherboards, there is no SLI certification. There is also a PCI slot for legacy cards as well as several PCIe 2.0 x1 cards for extra features. The rear panel has six USB 3.0 ports altogether, some provided by the chipset and others through a VIA VL805 controller. The rear panel also has two USB 2.0 ports, a combination PS/2 port, a quartet of standard video connectors, the Killer NIC port and gold lined audio jacks as part of the upgraded ALC1150 audio system. The use of a Killer NIC gives MSI access to software that controls program optimization of the network stack. As this is the E2205, this is solely a software implementation similar to others used on other motherboards with licensed software but with the Killer branding oriented towards gaming. MSI also states that the USB 2.0 ports are Gaming ports, capable of up to 1000 Hz response, although there is no software to confirm this and I do not own a high polling capable mouse to test. So, the A10 7850K beats an i7 4960X in 2 gaming benchmarks, and not a word is said about that in the article apart from "The MSI motehrboard takes the lead in CoH2 comfortably." I still find it quite a weird victory, even taking into account the GPU-limited state of BF4. CoH is also a CPU heavy title, and AMD seems to do well in it more often. I would like to have seen a comparison between the 9590 and the A10 in this case, instead of the more limited benches and comparisons in this article / review. Is the latest CoH2 update showing any speed improvements on the 4960x or other Intel processors? I understand if the new software version skews current results to the point that they are no longer comparable to older benchmark runs, but at the same time, this sort of stinks for the 7850k. AMD won a benchmark? Pull it, it has to be a fluke! > why would a user purchase such an APU and then disable access by adding a discrete GPU? Because they're a complete pillock.